I Bleed Crimson Red: Oil Platforms in the Gulf of Mexico - Worth the Risk? Oil Platforms in the Gulf of Mexico - Worth the Risk? A lot is being written and said about offshore oil drilling and safety. Is it worth the risk? As a resident of the Gulf Coast, I've pretty much accepted the fact that oil and natural gas are important enough to the nation's economy and national security to warrant taking some risk. And, over the last three decades or so, there have been some instances. But when you look at the sheer number of assets in the Gulf, the number of incidents pales in comparison to what's being produced. The map below shows the complete plot of all oil and gas drilling and production platforms in the Gulf of Mexico. Not all of these are active, but every point represents a well, drilling rig, production platform or capped well. There are approximately 4,300 points on the map. If we included all locations drilled since recordkeeping began in the early 1970's, there would be approximately 6,600 locations. Click the map image for a larger version. From 1979 through the Deepwater Horizon incident, the Gulf of Mexico has witnessed five major oil spill events. The first was the Ixtoc blowout, which is believed to be the largest accidental spill in history. The well blew in June 1979 and wasn't capped until March, 1980. Between ten and thirty thousand barrels of crude oil were lost each day over the eight month period. Estimates vary widely, but as much as 4.8 million barrels were lost. Later the same year, the Burma Agate collided with a freighter near Galveston, Texas on November 1, 1979. 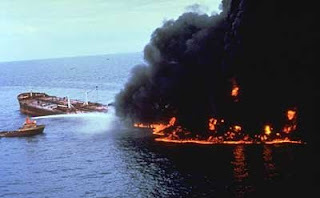 The ship exploded, killing 31 crew members, and spilled an estimated 2.6 million gallons of oil into the Gulf of Mexico. The ship and oil continued to burn until January, 1980. The gulf stayed relatively incident free until 1990, when the Norwegian megatanker was transferring oil to smaller ships (called "lighters"). The megatanker suffered an explosion in its pump room, caught fire, and either spilled or burned 4.2 million gallons of oil for about a week. The fire was so large and so intense, firefighters could do little more than pump seawater onto the fire. Early on the morning of August 10, three barges carrying fuel oil and jet fuel collided in Tampa Bay, collectively spilling an estimated 14 million gallons of petroleum products. State and federal responders mobilized rapidly to contain the material, and their response (plus some help from Mother Nature in the form of favorable tides) mitigated much of the potential damage. US Coast Guard estimated that approximately seven to ten million gallons of oil and petroleum distillates were spilled during Hurricanes Katrina and Rita. The losses were from various sources, including pipelines, storage tanks, drilling rigs, production platforms and industrial plants. Creating one of the most famous images of the storms' havoc, Katrina ripped the Ocean Warwick platform from her seabed moorings, and ran her aground at Dauphin Island, just south of Mobile, Alabama. The owners had hoped to salvage the rig and repair it. 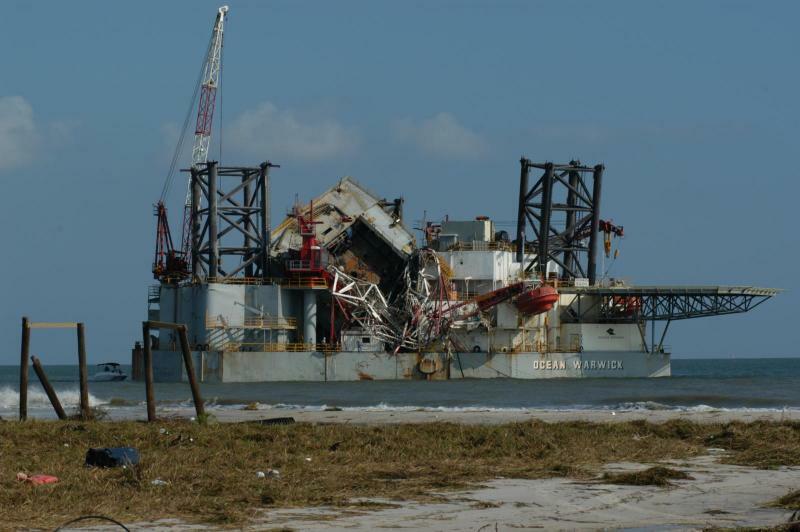 But Hurricane Rita's storm surge (which reflooded New Orleans) hammered her again and she was scrapped in place the following year. Those are pretty nasty events. But 31 years, anywhere between 4,400 and 6,600 platforms or wells, and only five major accidents? I'm thinking that offshore oil and gas production is about as safe as say, flying on a commercial jet. Is it worth the risk to fly? 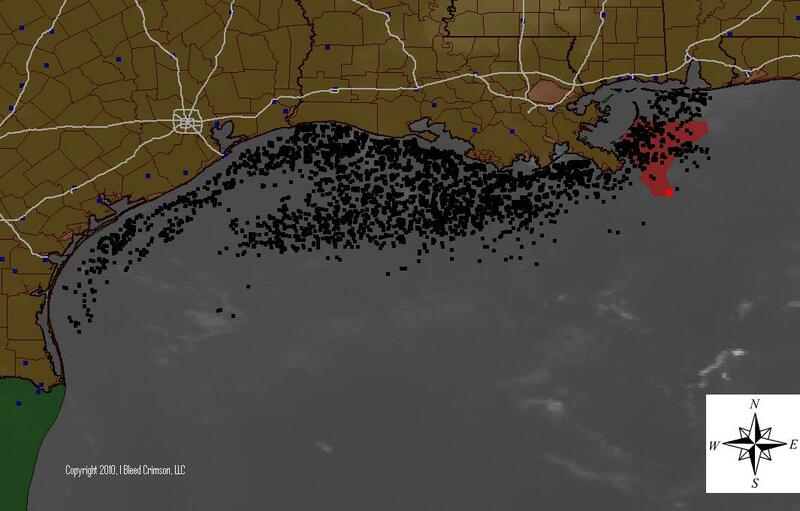 Extra Point: The red-tinted polygon on the map shows an estimate of the current size and location of the Deepwater Horizon spill. Is it still worth it? Do you know anything about Corexit 9500? Yes, it's still worth it. And yes, I know what Corexit is. See this post. do you know where I can find the GPS position of these rigs? 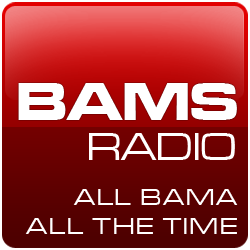 You can download the raw data at the former MMS's website: Geographic Mapping Data. These are in ASCII, E00 and DXF format. If you want them in ESRI shapefile or GPS-compatible waypoints, you'll have to manipulate the data.